While the idea of driving is exciting, the process of actually getting the license to do it can be stressful. Our course is an easy way to eliminate the hassle and let you concentrate on how fun it will be to get behind the wheel. If you are are eagerly waiting to start driving, you can get your license faster than ever before with our California Teen Drivers Ed course. How fast? 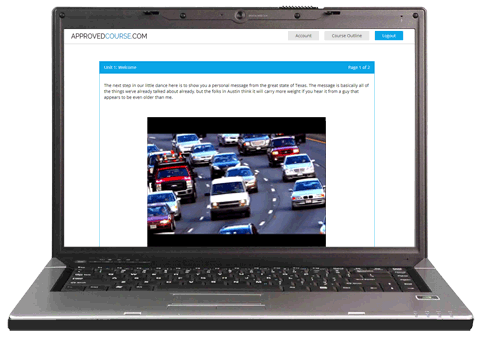 Our course is the shortest drivers ed course allowed by law and is easier than any other to complete on the go. Our course is offered through our partners at Aceable.com and is available by mobile app or on the web. Why spend hours cooped up in a classroom when you can complete California DMV Licensed drivers ed online or right on your phone? With our course there’s no need to rearrange your schedule and catch a ride to a classroom. Simply fire up your computer, tablet, Apple or Android device and you are good to go. Home or school, middle of the day or the middle of the night, the choice is up to you. You determine the when and the where to get what you need when you need it. Our advanced learning system teaches you everything you need to know to be the safest, best prepared driver you can be. What Makes This Course a Good Choice? You can take it on computer, tablet, even your phone! Completing your driver training is a big step and sharing the road safely is a big responsibility. Get started right by signing up for your california drivers ed course today! STEP ONE: Sign up for our California DMV approved drivers ed course school and complete it by app or web. Once you’ve knocked it out we’ll mail you a DMV certificate of completion (DL 400C) so that you can get your provisional learner permit! STEP TWO: At the DMV you’ll be taking a written permit test and you can get ready for it with unlimited free permit practice tests in the Aceable app. Once you’ve aced the permit test, you’re ready to hit the road. The California Graduated Driver License (GDL) program requires that a teenager completes six hours of driving lessons and 50 hours of practice driving with a licensed driver over age 25. STEP THREE: Once you’ve finished our course and your behind-the-wheel training, it’s time to go back to the DMV for your driving test and, just like that, you’ve earned your California drivers license and are legal to take the wheel! Get Going and Get On the Road!